On a sloping hill overlooking the poetically named little town of Sugar Creek, Tennessee, rests an old cemetery where, in the 19th century, the people in the village buried their dead. Some of the stones date back to before the Civil War. Those who once tended the one hundred or so graves have long since departed this world. Only random aluminum cans and scraps of windblown paper and plastic keep them company now. The old timers call the strip of land The Resting Place, but local legend suggests it is anything but restful. Maybe everyone sees that which they believe in. This is a statement that resonates with many Sugar Creek residents for good reason. Whether the members of the McCullough, the Langford, or the Finch families ever found rest was a dubious question considering how their lives and deaths spun out in curious directions. For some, a century and a half might not be long enough to find eternal rest. 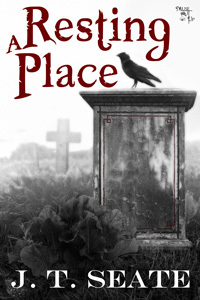 It is for a newcomer to try and answer the question, for he is destined to stir echoes from the past as the tales of Sugar Creek, the resting place, and its most memorable ghost again become more than the murmurings of ancient history. At her bedroom window, Polly’s current thoughts moved from Gladys’s sing-song voice, and the off-tune old ladies at Emily’s graveside, to the shapes that steadfastly resided beyond her house. The light breeze ceased; the owl quieted. All was as still as death along the road that passed by her gate. The stillness was eerie rather than peaceful. Everything slept, almost everything, for the next sound was something that bore the quality of her frightening stories—the squeak of a door opening. She walked from the window to her own bedroom door. The boards again protested under her weight. She eased the chair from beneath the doorknob—a precaution she had taken ever since Emily’s murder. Incongruously, she thought of Priscilla. She had never seen the image locals swore to having witnessed, but it was not a haunting she was worried about. A perpetrator was still on the loose and she had no confidence in local law enforcement. Sheriff Spalding was good at cards, but little else. What makes a human want to hurt another human? Honor? Loyalty to country? Those seemed humble and misleading excuses for delivering carnage. Polly did not understand the impulse, but people did it all the time. The war and its aftermath was a testament to that. Another question overrode both of these. Why had Edwin wound up bedridden? Why did he have a stroke in the fields and turn into an invalid and leave her with all the work? If he were well, he could go plodding through the house with his pistol. What defense did she have, an older woman in a house too big to tend properly? But Edwin would not have done that. “Foolish old woman,” he would have said to her. As Polly’s mind returned to the present, she felt compelled to check the house. She slowly opened her bedroom door and peered into the hallway. Edwin had his own room down the hall. No reason to change accommodations after all these years. Although he’d had the stroke and could not manage getting to the privy, “to tap a kidney” as he used to say, he remained somewhat mobile, usually when Polly did not want him to be. He had crawled from his bed a couple of times while she was in the throes of a story and scratched at her bedroom door, scaring the living daylights out of her. He couldn’t speak; only move his jaws pathetically in that helpless way of stroke patients. She took in meals and helped him with the eating process ever since he knocked over a glass and spread a lake of milk over the floor. She cut her finger picking up the pieces. She briefly considered a convalescence hospital, filled with veterans never to recover from their wounds, but it was too many towns away and beyond their financial means. An occasional visit from the horse-and-buggy doctor they had for the whole county would have to do. Polly ventured into Edwin’s room several times a day, but not normally at night. She padded barefoot down to his door and turned the knob. There he lay, the jaw working up and down, trying to utter something, or just dreaming the dreams of those lost in some world between this one and the next. She barely looked at his paleness, or the cracked and dry lips. The air was thick with the atmosphere of a sickroom. She walked to his window and peered out into the moonlit night. It reminded her of how isolated she was. On the outer windowsill, a fallen leaf was snagged. It was brown and gnarled, curled upon itself like a crunchy, dead creature. It gave her a start, a reminder that death was all around. Edwin’s breathing was too shallow to make noise. It was only the thumping in Polly’s chest that did so. She reentered the hallway and quietly walked into the main room. Again, everything was bone chillingly quiet, but the air was cooler than in the rest of the house. Only one reason—something was open. Yes. She and Edwin were not alone in the house. “Who’s there?” she called, but all she heard was her own voice echoing back like the lonely cry of a ghost. She felt her pulse quicken and wondered if someone or something could be hiding along a wall just out of sight; some giggling thing which would reach out and grab hold of her ankle when the time was right. Another creak. Nothing could be as nerve-wracking as when an old house seemed to become organic. She had a sense of foreboding like when entering an unfamiliar place as a child, and when she saw her front door was ajar, she felt a cold spot where her heart was supposed to be. All around, dark secrets clung to every corner. She sought the courage to reach for an oil lamp. It did not come. She was too afraid that something cold and slimy would reach back. Whatever is lurking, it has trapped us in here, Polly decided. Me, with a husband who is already at death’s doorstep. Something dreadful was about to happen. She was at the final stage of desolation. She headed for the door to shut it soundly when she noticed what was different. Something blocked the outline of a coat tree next to the open door. A dark shape stood there accompanied by the sound of steady, labored breathing. Polly gasped. Bile rose in her throat as she put one hand to her mouth to halt a scream. The shape lit an oil lamp and turned the flickering wick higher until features became recognizable.